My family have been the proud owners of one of those orange-covered, binder-type Betty Crocker cookbooks for as long as I can remember. Before I went vegan, it was the go-to cookbook for everything from Christmas cookies to birthday cakes. 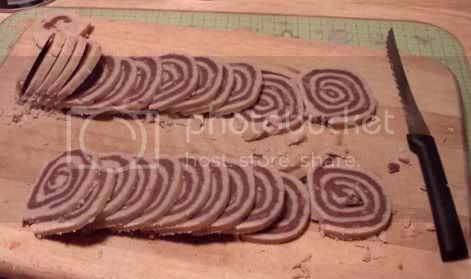 One of my favorite recipes was for pinwheel cookies, a sort of shortbread cookie involving plain and chocolate dough rolled up together to form an attractive, tasty swirl pattern. I tried them out around Thanksgiving one year on a whim, and they quickly became a household tradition for the holiday. After going vegan, though, I didn’t really give them much thought. The fact that they’re held together mostly by butter weirded me out for various reasons, so the tradition lapsed for a couple of years. But no more! This year I decided to take a crack at making these delicious, totally-not-good-for-you cookies vegan. They’re a little crisp around the edges, a little soft in the middle, and amazing topped with vegan whipped cream. I decided to call them “Chocolate Swirl Shortbread,” since it describes the groovy swirl you get when you slice them before baking. 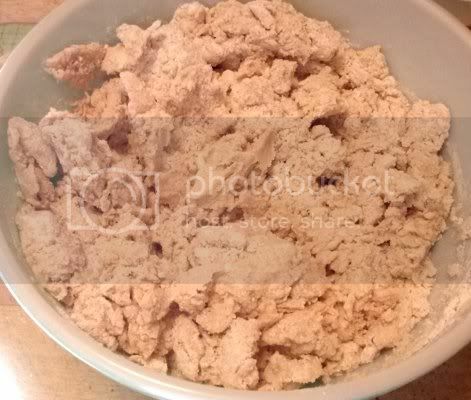 1) In a large bowl, mix together the margarine, shortening, flax seed mixture, and confectioner’s sugar until smooth. 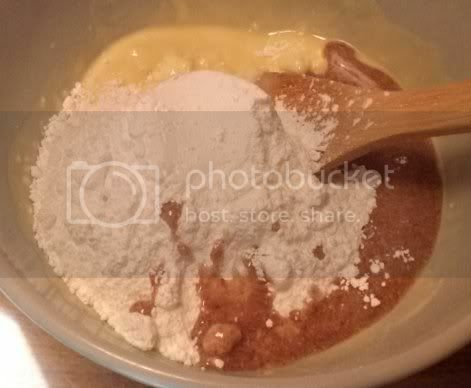 2) Add the flour, mixing until well-combined. 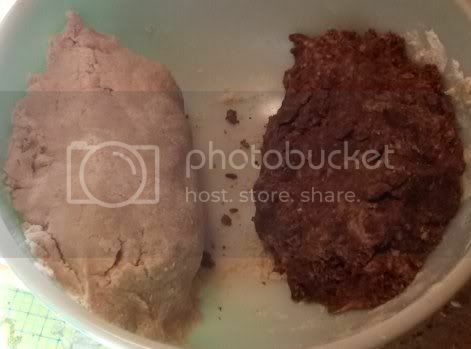 This is a stiff dough, so you may have to stick your hands in it to work in all the flour. If that’s what you have, you’re good to go. You can place both the plain and chocolate dough back in the large bowl if you wish. 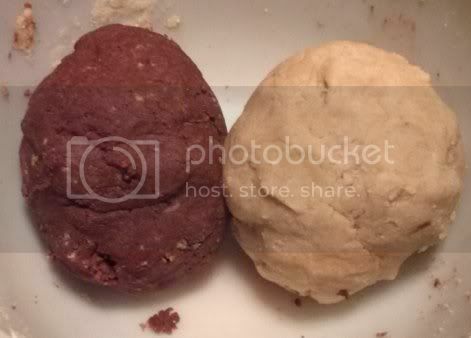 4) Cover the dough and refrigerate for 1 hour, or until firm enough to roll out. 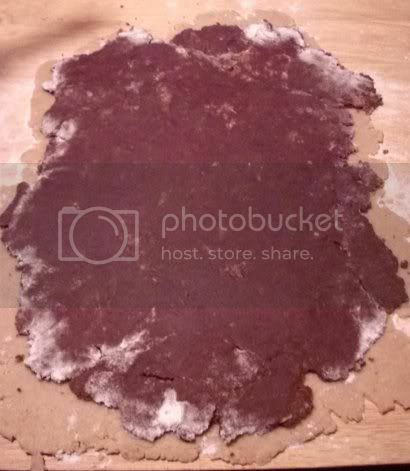 5) On a lightly-floured surface, roll the plain dough out into a rectangle, somewhere between 1/8th and 1/4 inch thick. Do the same with the chocolate dough. Place the chocolate dough on top of the plain dough and take a moment to pinch together any dough that fell apart when you moved it. 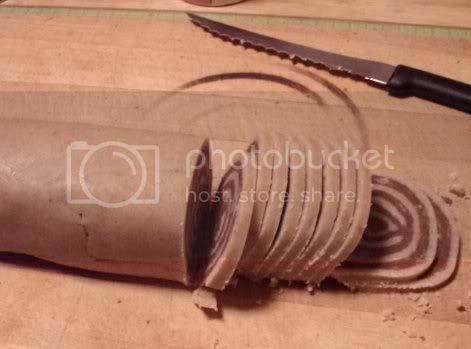 6) Carefully roll the dough up into a log and fold or tuck the ends in. Even out the resulting “cookie log” until you’re satisfied with the shape. Wrap in plastic wrap and chill for 8 hours or overnight. 7) Preheat the oven to 400ºF. Unwrap the cookie log and slice into cookies about 1/8th inch thick. A good, sharp knife is your friend for this step! If the dough is crumbly, let it warm up a bit before slicing. 8 ) Place the sliced cookies on ungreased cookie sheets. These don’t spread a lot so it’s not necessary to separate them too much. If a cookie falls apart in transport, it should be greasy enough that you can stick it back together. 9) Bake for 8 minutes, until the edges are golden. Transfer immediately to wire racks and cool completely. Store in an airtight container. Ooh your cookies look fantastic and I love that they’re a tradition for you now! I’ve never tried to make pinwheels before, I should give them a go!